Wear something comfy and sporty and bring a yoga mat if you have one and feel inclined. This class was so popular we decided to bring it back! You may never have guessed, but hula hooping is not just for little girls. Hula hooping is for everyone! Aside from giving you joy and impressing your mom, hula hooping gets you fit, improves your coordination, and gives you great bragging rights. 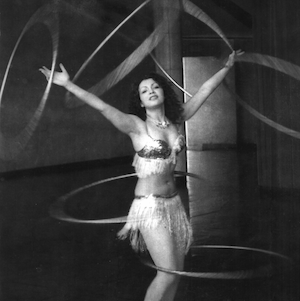 You’ll receive a comprehensive lesson offering a mix of hula hoop tricks, transitions, and fitness routines. You’ll learn a sequence of moves designed to flow into each other – allowing you to combine them into a slick routine that’ll impress the heck out of your friends. You do not need any prior hula hooping experience and the class is suited to any level of fitness, age, gender, and ability. Hip Hoop is the brain child of Deryn “Foxie” French, an Auckland-based freelance circus artist specialising in Hula Hoops, Pole Acrobatics and being an “all round” quality entertainer and instructor. Deryn takes pride in ensuring you have a great time at her classes, and does her best to keep you entertained excited, and wanting more – passionately sharing her passion with each and everyone of her students. Visit hiphoopfitness.co.nz for more info on Deryn and Hip Hoop. The featured image is borrowed and edited, with thanks, from Elena Ringo.